heather & olive: sriracha fried rice egg bowl. 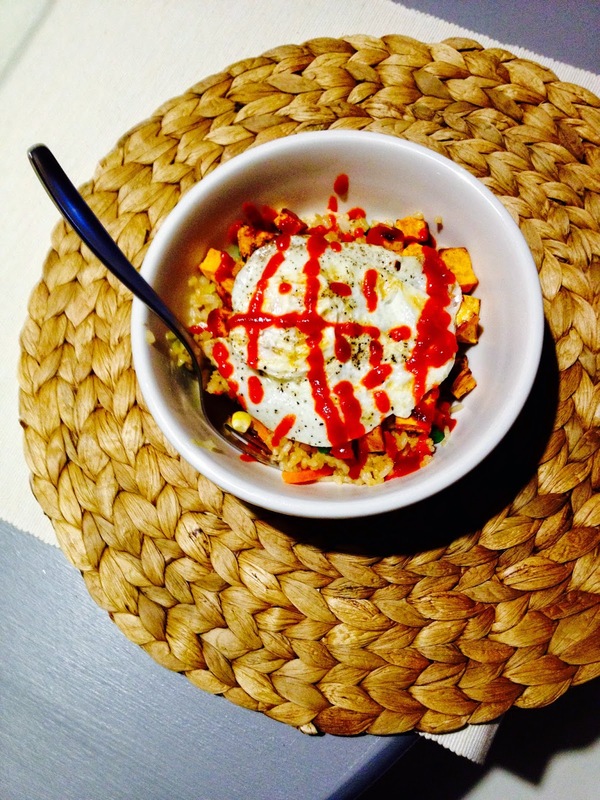 sriracha fried rice egg bowl. I really love cooking elaborate dinners, but most weeknights, it's not in the cards. By the time I get home from work I'm starving and looking for something quick and easy to make so I can focus on the important things, like reality television. When I did my sister trip to Chicago last year, Mer and I had a delicious brunch at Sable and I fell in love with their Ginger-Scallion Brown Fried Rice and Eggs. Although my version is slightly different, it makes for a quick, filling (and healthy) option for weeknights. If I have them on hand, I'll cut up some sweet potatoes, drizzle them with olive oil/season with salt and pepper and roast at 400 degrees for 20-30 minutes (flipping them once halfway). As they finish baking, I cook up some Trader Joe's frozen vegetable fried rice (adding some ginger) and fry an egg in some butter. Once everything is hot and ready, I'll assemble the bowl and drizzle sriracha and then...dinner is served! #putaneggonit is my go to dinner! Making the rest of us look bad! I need to give you back your cook book!